You probably already know that most science fiction movies feature terrible science, and especially awful physics. But some movies feature scientific mistakes so basic and so terrible, they give you what can only be described as a "logic coronary." Here are seven movies with scientific flaws so bad, whenever someone rents one of these flicks Neil deGrasse Tyson gets a migraine. Plot: Before he was hanging out with Ace Ventura, Spike the monkey was shipped to the USA chock full of something called the Motaba virus. It's Dustin Hoffman's job to stop the virus, prevent an outbreak and foil Donald Sutherland's plan to firebomb a small town. The Real Science: The problem with this movie is time. Like Jeff Goldblum in Independence Day, Hoffman whips up a cure sooner than it takes me to understand the joke in a New Yorker Magazine cartoon (my record is three hours). Normally it would take a team of virologists weeks or even months to study the virus, go through the appropriate tests and create a cure for distribution. "That's right; you're reading this in my voice. Rubber baby buggy bumpers." Plot: An asteroid the size of Texas is hurdling towards Earth at about the same speed it takes for me to buy a gun in the aforementioned state. NASA decides to get Bruce Willis and his rag-tag team of oil drillers (think The Expendables brought by way of British Petroleum) to eat Animal Crackers off Liv Tyler's tummy, fly into space, drill a hole in the asteroid, drop a nuke, blow up the rock and fly back. The Real Science: Here's the deal: there's so many inaccuracies in this movie it's hard to pick one; however, there a few key problems that make this movie ridiculous. Number one is that we would most definitely see an asteroid the size of Texas well before the last minute. The United States alone has a number of observers including JPL's Near Earth Asteroid Tracking and the Air Force's Maui Space Surveillance Site, not to mention private citizens like this guy. Not only would we know about and be tracking an asteroid that size floating in the main belt, but we would see it coming far sooner than the movie led us to believe. "Don't worry Hawking, I got this." Oh, and their plan of drilling a hole 800 feet and placing the nuclear bomb into it is hardly likely to work (even with the stupid fissure). If the asteroid is the size of Texas it would be about 870 miles across. 800 feet to something that size is the equivalent to scratching the surface of a volleyball. And don't counter with the movie's "fissure will crack the rest of it in half" argument; that's what we call a Deus Ex Machina and this list is about bad movie science not bad writing. Plot: A small group of people get trapped in a theme park that is overrun with dinosaurs. Think of it as the last movie in a trilogy that includes "Westworld" and "Futureworld", but instead of Yul Brynner you get a group of Velociraptors that can open doors. And I know you're thinking, "But Yul Brynner wasn't in ‘Futureworld!'" The Real Science: If we wanted to clone something the DNA has to be perfect and even DNA trapped in 65 million-year-old amber would be way past its expiration date. Also, contrary to what Mr. DNA tells you, we can't substitute other species (like, say, from a frog) to complete the chain. Even if we could hypothetically extract a perfect strand of DNA that wasn't tainted by the insect's DNA or horribly degraded, could we do it? Hell no. You see, we would need a viable, living dinosaur egg for implantation. Since the whole point was to create a dinosaur because they're extinct then we're kind of at an impasse. "T-REX HUNTS BY MEMES! RUN!" Plot: The Earth's inner core stopped rotating, our magnetic field is tearing apart, microwave radiation is ripping through out atmosphere and the world is thrown into chaos! Up is down, right is left, birds drop dead, pace makers stop working and I embrace the term "YOLO!" Hillary Swank and her intrepid crew of "terranauts" must drill into the center of the earth and activate a nuclear bomb to kick-start the core. The Real Science: Let's forget the problems actually getting to the center of the earth, all the overlooked science (how in the heck did they stay in radio contact so far under the surface?) or the terribly conceived hurdles the team overcomes (how are they able to walk outside their craft in the recycled space suits from "Sphere" when the temperature would be thousands of degrees and the pressure would be immense?). 1) The earth's magnetic field has little effect on microwave radiation. 2) Sure, the sun lobs plenty of microwaves (electromagnetic radiation), but that is just light. The worst we're looking at is our radios and cell phones fizzling out. In essence, there isn't really a disaster in this disaster movie. "… and in the center past the mole people, we find creamy nougat." 5) It's Impossible for a Volcano to Form Under L.A. Plot: Ancient mammals from the Pleistocene era decide to get their revenge on modern day Los Angeles by generating a super volcano in the La Brea Tar Pits. Tommy Lee Jones reprises his role as "ornery-old-guy-with-a-heart-of-gold-that-mumbles-a-lot" and joins forces with seismologist Dr. Anne Heche to save the day. 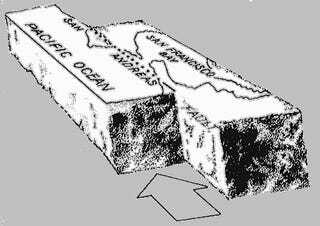 The Real Science: The San Andreas Fault traveling through the west coast is a "strike-slip" fault; that means the Pacific plate and the North American plate creates a fault line that only slide past each other. In order for a volcano to form, two plates need to "subduct:" i.e, one plate slides underneath another allowing magma to move to the surface. The plates in Los Angeles and the rest of the southern California area do not subduct; that really only happens further north. "A handy place to put your copy of ‘Volcano' is right in the crack…"
Therefore, we have a better chance of Anne Heche giving me my money back for "Six Days Seven Nights" than a volcano erupting in Los Angeles. Plot: A highly advanced alien race invades the planet and destroys all of the Earth's major landmarks. With the help of Will Smith, Jeff Goldblum was able to upload his computer virus into the alien mother ship and save the day in time to fire up that bar-b-q and knock back a few brews. "And make sure you don't leave any smudges on the mirrors this time, Carlton." The Real Science: This one is relatively easy to point out: how in the hell did Jeff Goldblum figure out how the alien computers work, let alone design a computer virus to infect them? I mean, sure; we had that scout craft for 50 years, but if Data couldn't work it out, then how did Jeff Goldblum do it in an hour? We're also pretty lucky that the aliens installed a USB or parallel port so we have easy access to their controls. Maybe the aliens should have switched to iPads. "I guess we could just duct tape a joystick on the dashboard and see if it flies." Plot: Aliens decide to invade our planet and only Bravehart, Johnny Cash and a group of weird kids can stop them from ruining their crops. Thank god our heroes discover their only weakness… water! Commander: "Do you have the planet's readouts?" You: "Yes Sir. 70% of the planet is covered in a substance that will seriously harm and eventually kill our species. The flora, fauna and atmosphere is also composed of the same substance. I really don't think this plan is—"
Commander: "Perfect. (TURNS TO THE REST OF THE SHIP) Gentlemen! Let us not forget our proud warrior cry!" Everyone on ship: "LEEERRROOOYYY JEEENNNKKKIIIINNSSS!" Seriously, did they not notice about 70% of the world's surface is covered in water, 3,100 cubic miles of water is floating around the atmosphere and 2,000,000 cubic miles of water is stored within a half mile of the earth's surface? Even if they did and continued with their invasion, whose bright idea was it to plop down of the surface with no protective gear? That would be like us mounting an invasion to a planet that's covered in acid wearing nothing but tinfoil hats. "Prepped for the surface, captain." This article by Charlie Knauf originally appeared over at Ranker. Check out more movie related lists here.